Sir Henry Belfield was succeeded as Govenor by Sir Edward Northey at the beginning of 1919.The change-over marked the commencement of a period during which Nairobi gained a constitituational advance, suffered a postwar recession and was faced with new problems of representaion and organisation through the rise of Indian political aspirations. The committee was still advisory in its function at the end of the war and the official side was able to outvote the unofficials on any issue. Responsibility for thev township therefore still rested in the hands of Government although unofficial elections, at any ratefor the European unofficials, were conducted. One of the new Governor's first actions was to issue a directive on the relationship betwwen Government and the town. The chairman, reporting this, said that his Excellancy "desired to see things move out of stagnation into which they had fallen during the years of the war and the Colonial Office would support all rreasonable plans for improvements in the management of municipal affairs. The first means of securing the application of the Corporation Ordinance ( of 1909) should be tackled at once while he realised that the full powers granted to a corporation would only be assumed gradually." His Excellency preferred the method of interview in all transactions between him and the committee and the opprtunity was taken to ask the Governor that the committee should have details of any new cincession to the Electric Light Company, for already the committee was playing with the idea of greater control of the town's lighting and power services. In July 1919, the Governor agreed to the immediate application of the ordinance. Discussions followed on such matters as the conversion of court fines to municipal revenue, the transfer of responsibility for roads and drains, the status of the Health Office and above all, the question of Asian representation either by election or nomination, but in view of the Governor's wishes, would agree to three nominated Indian members being appointed. In October 1919 the Governor lost an eye while playing polo and the council passed a resolution commiserating with him in this misfortune, but this disability did not seem to affect the Governor's ability to receive municipal duputations on all subjects, the chief of which was the discussion of the details of corporation status. The first election of European councillors to the new corporation took place in January 1920, when Mr W Isherwood headed the poll, and his Excellency nominated the fifteen persons who received most votes. The new council took its seat in February and sorted itself into committees. The chairman was Mr F G Hamilton - the last Government official to hold the post. He was for some years Resident Commissioner for Nairobi and initiated the Native Affairs Departmentof the Council. Messrs. Dalgety's present premises in Eliot Street were named after him and construction by the Civil Servant' Co-operative Society. When the society got into financial difficulties and was about to go into liquidation " Hammy," as he was affectionately known, gave them £500 to enable them to meet their creditors. In July, Hamilton proposed "that a moredistinctive title be adopted for the chief of the municipality of Nairobi, the capital of the Protectorate" and suggested the title of Mayor. 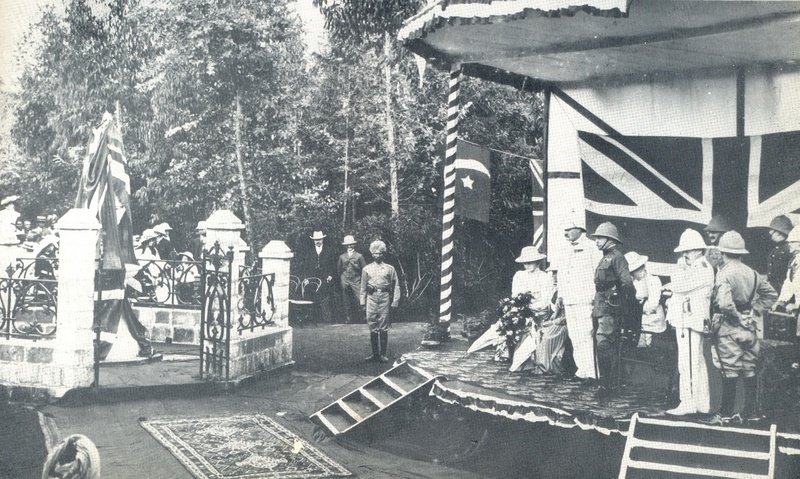 The unveiling of the statue of Qeen Victoria in the Jeevanjee Gardens. Colonel J Ainsworth and Lieutenant Harrison.